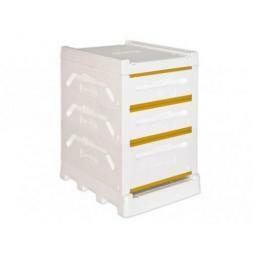 This category contains all of our Langstroth hives from leading manufacturer Paradise Honey. 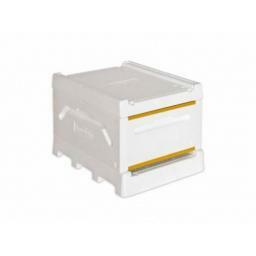 Before being taken into use it is essential the hive components are painted. This prevents the growth of algae on the outside of the hive, deterioration by UV and in the case of the feeder is required for sealing and ease of cleaning. We recommend the floor and roof are fully painted on all surfaces but the brood chamber and supers need only be painted on the outside. Ideally two coats of paint should be applied, though one will suffice. The feeder requires additional painting on the inside, where the syrup sits. At least 3 coats are required otherwise the syrup will soak into the feeder and mould etc., will continue to grow even after you have washed it out. The interior "walk-way" the bees climb up through does not need painting but the surface the bees walk down to reach the syrup benefits from a light roughening with fine sandpaper to help the bees grip. If you have strong fingers the hard plastic edges can be slid off prior to painting for a neater finish. Water based exterior smooth masonry paint is recommend for all surfaces other than the inside of the feeder. This is quick drying and easily applied with a 4" wide fleece roller and a ½" brush for the fiddly bits. We have found Dulux Weathershield Smooth Masonry paint is an excellent choice. This paint contains an acrylic resin and gives excellent coverage and wear characteristics. Woodland Pearl No 1 in the Tailor Made range of this paint is an excellent matt green that suits the hives well. We used to recommend Cuprinol Garden Shades but it is not very hard wearing and we feel the extra durability and better coverage of the Dulux paint is worth the extra cost. One litre will be sufficient for two hives with supers although you will find you probably have to buy a 2.5 litre tin.